Smartphone users, this one’s for you! Ever wish there was an app to tell you how long wait times are and when you can expect to find a character meet and greet and what’s the deal with the weather? 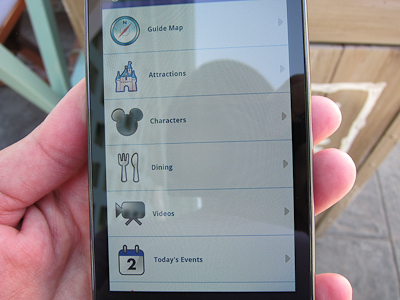 One that would track you inside the parks and give you location-specific information? That’s free? Well, my friends, it exists. 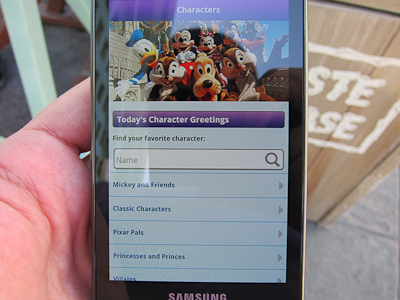 If you do have a smartphone, you can download Disney Parks’ official app, Mobile Magic. In order to give you a look at Mobile Magic in action, I took a series of pictures of my phone. Be prepared for some high-quality photography here. It's all official looking and everything! 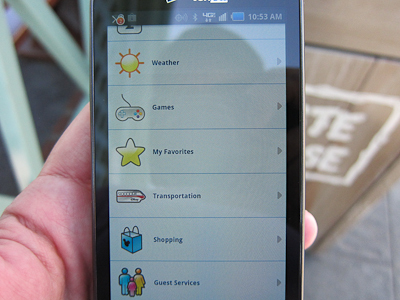 Once the app is loaded and running, you can choose from a variety of things you’d like to know about. A map? Who needs a map? I checked this out right after I got off of Big Thunder. I wanted to see how long the wait was for Haunted Mansion before I schlepped my lazy self all the way over there. Mobile Magic pinpointed my location. 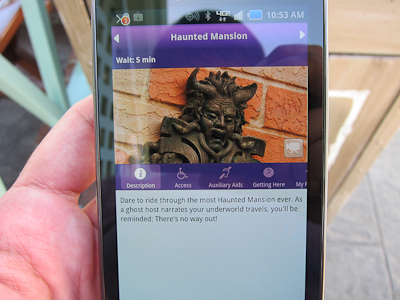 The Haunted Mansion was at the bottom of the list of attractions within the vicinity. On that screen it says that the wait is 5 minutes, but I wanted to see what the Haunted Mansion screen itself looked like. There’s a brief description of the attraction in case you don’t know what it is, and again, the wait time. 5 minutes was indeed accurate! If you’re character hunting, the character feature might come in handy too. 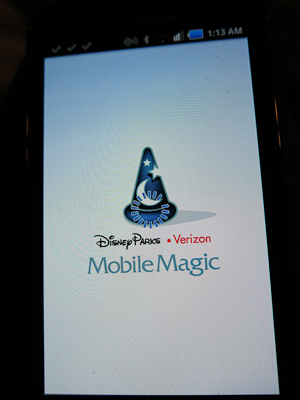 If you’ve got a smartphone on Verizon, I highly recommend Mobile Magic! If you’re not on Verizon, you can also use your smartphone to access the Disney Parks mobile website, which will give you the same information, but not in such a cute and handy app. Thanks for the tip. Downloaded. Looks like it’s not Verizon specific, any Android should get it. I have MetroPCS but with my luck, I’ll get no service in the park. Love your blog, new reader, keep up the good work. Fixed it! And welcome to MYWTM! A few months ago they announced that this app is now available to all smartphone users. I downloaded it on my Android. We used it the last time we were at the park. It lagged a bit, probably bad service, but was a neat app. Fixed it! I honestly wonder what took Disney so long to create this, but I like using it.